What’s with the blue and green??? What’s up with me and blue/green lately? Seems like I’m making lots of blue/green paintings. Oh yeah, I have to admit this goes in cycles. I paint so many orange and red paintings and then something’s gotta give and I paint cool tones for a while.The same thing happens with direction since I’m prone to paint vertical paintings so now and then I have to paint some horizontal ones. Just hope the trend is for these colors right now. I do read up on that stuff now and then but by the time I get around to trying some new trend, it is no longer new half the time. Guess anything I paint will just have to wait for its own special “time” or wait around for the next cycle to come by. Who knows as this is only the second layer of what sometimes turns out to be MANY layers, but it’s still blue/green. By the time it’s finished I might be feeling orange/red again! 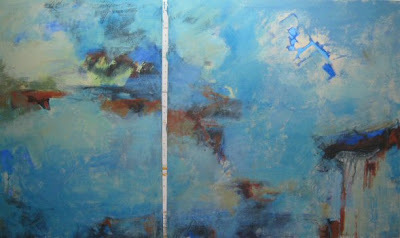 Of course that will be a lot of paint since these two pieces are a total size of 40 x 70″. So much for the idea of keeping your in process stuff hidden until finished. But, that idea is just not my personality anyway. I’m using this blog to communicate with myself as much as anyone else. Today two of my grandkids came to stay while their mom was working. Since it was the last day for them to come here before school starts again, they decided they wanted to paint. It’s been some time since I’ve had them in the studio since I had so much stuff out all over the place with the wax,etc. Today was special as their granddad pointed out….last day to paint for awhile. So out came the artist quality watercolors (only kind they’ve ever used). I hunted for something to paint on and came up with rag mat board. The nine year old pointed out that sister Kayleigh’s mat board wasn’t as large as his….so back to the bin of mat board so they could be fairly equal. I got all the water, brushes, paper towels and everything out and left them to go at it. I came back later and they had switched painting spots and Brendan told me they were working on each others work…. (collaboration in youngsters already). I noted that they had chosen a complimentary color scheme and pretty good, minimalist composition. (Wondering if they’ve been watching more than I thought.) Next time I came back they explained that they were going to combine the works by placing two of the pieces together (good gosh, a diptych)………and how they might put the smaller piece in somewhere to add to it, maybe, but maybe not. Heck, they even have been subscribing to my thought processes of relationships. I asked if they wanted to add some marks or drawing to the work. They worked really densely with the watercolor and couldn’t lay light over dark as they must have been watching Gran with acrylic. They thought about it but decided, no, not on these, just keep it simple and start a new piece. But I saw them both pencil in hand going at some of the other pieces of mat board. Brendan told me this was really gonna be good. He told his granddad the same thing when he came in to check on them. …Said they were getting LOTS better at painting. I can’t believe I didn’t take a picture. Take my word for it…..blue and orange for the diptych. Blue, green, yellow analogous combinations with a tree shape no less for the extra piece. It’s possible I will do more to this painting, but, also, entirely possible that this painting is finished. Now that I’ve photographed it and see it in a different light, so to speak with a digital image, I know what is bothering me more than just the actual physical texture. It’s the little white dots from the first layers….they peek out all over where I don’t want them unless I actually pour huge amount of color over them to fill in the spaces. I’ve scraped, and fused and that doesn’t do all that much unless I want to totally melt/scrape down the previous areas. I don’t want to do that too much but need to make less visual texture in some areas. Now I think this does work so I’ll remember in the future that unless I plan on a very light valued finished painting, I can save myself some wax/time and effort to start with a darker under-painting or tone all over like I do with acrylic. 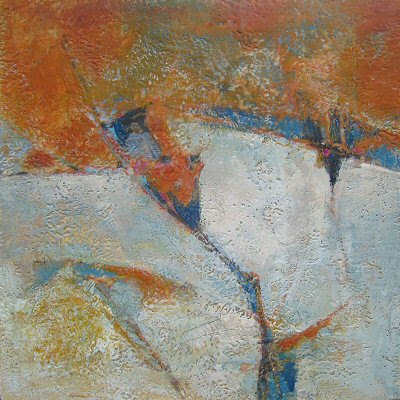 For some reason this painting makes me think of snow on the mountain. I have no idea what the title will eventually be. Maybe just coming home from the White Mountains of AZ is the reason that title popped into my head. Although there was no snow in August…funny, huh! 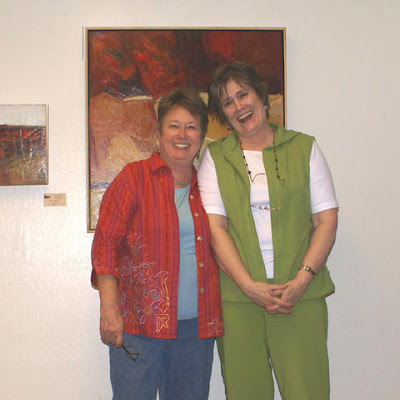 Wishing for the cooler climate today and all this past week that I enjoyed there at my show reception. I got a photo from Gwen of the two of us at the second day reception. The show closes at the end of the week. So, go by the Joyous Lake Gallery if you haven’t had a chance to meet Gwen and see my work while it’s still there in the gallery. It’s the process and it’s not over! OKAY….this will NOT do. 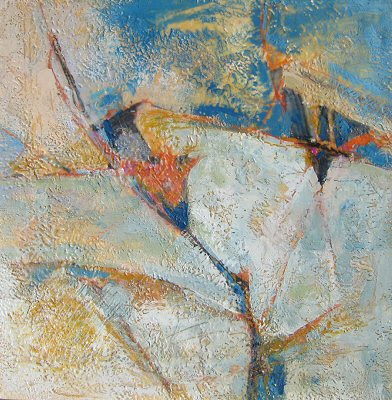 There is waaaay too much texture on this encaustic painting. Working on a 24 x 24 canvas covered panel is like using a tiny brush and making dots……not the big swaths of color I’m used to getting with the gesture of a more fluid medium like acrylic paint. First off, adding medium to the untreated canvas was a two day off and on job. Canvas soaks that wax up a lot more than just wood panel. There must be a better way to have absorbency but not so much. Then I got out my oil pastels and oil sticks and made gestural drawings and a design as such. I added more medium…fused and all that good stuff. Then I figured I’d try to add more color variety by getting out the oil paints. Oil paint and beeswax are compatible while the oil is still wet and can be fused together. I’m still bumbling around with my palette of color with the waxes. I don’t have a full palette of my usual colors to mix. I guess you can say that might be good at times to get out of your rut, but I kinda like my rut until I decide to get out of it. Getting back to the texture and limitations on the palette. I put the oils out and they are fairly stiff texture so they wouldn’t flow onto the painting. I hesitated to add anything to them as then I wondered if I could fuse them safely. Finally I decided, “what the heck, I gotta thin these paints down”, and I used a solvent. I made sure it had all evaporated before getting out the heat gun, too. It seems to be working okay but I missed a couple of places last night putting medium on top before fusing so I had to do that this morning as I could feel the paint tackiness in just a couple of places. Then I just kept adding medium, encaustic paint, fusing and scribbling with paint sticks. Now I’m at the point where I started……too much texture all over this painting. I know some people might like this all over stuff, but I like texture vs. smoothness….not all over for my aesthetic. I, also, will be doing more with all this color all over….hum, maybe lay down a big solid area.That’s if I can get a big solid area going. OR, maybe cover a whole lot of it up and scrape down to excavate some of it again. Whatever, I’ll have to keep working although I was supposed to be painting on those two 30 x 40 and 40 x 40 canvases over on my painting wall today. AND it’s HOT.